My husband loves to give me new gadgets for Christmas. Sometimes I think ahead and ask for specific items that I know I want. This year I knew I wanted a popcorn popper. Of course it is one that air pops so there is no oil or added calories involved in the popping! He did some research and decided on the Cuisinart CPM-100 EasyPop Hot Air Popcorn Maker. I love it! For less than $40 on Amazon it is a great buy to provide for a super healthy snack. 3 tablespoons of unpopped corn is 120 calories and makes about 6 cups of popcorn. A great afternoon snack. And as I wrote about previously in my blog- Popcorn-even healthier than we thought!- popcorn is loaded with antioxidants and fiber so it is a very healthy snack to choose. It is also reasonable in calories for a sizable quantity. When I am ravenously hungry in the late afternoon a bowl of popcorn fills me up and keeps me from making bad choices because all that knoshing on the kernels is really satisfying. 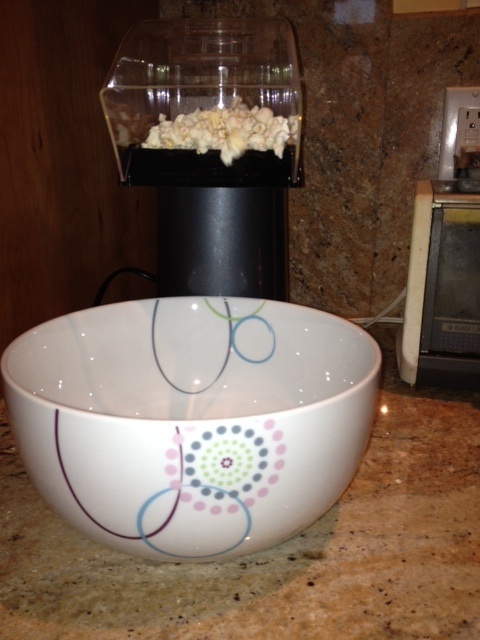 We have already enjoyed a number of bowls of popcorn in The New Year since the whole family loves it as a snack!